Izzy is obsessed with Virgin Galactic. She has bookmarked its website on my computer, and loves sitting on my lap as we watch the company’s showreel together. “When can we go on it, Daddy?” the 5-year-old pleads excitedly, as we watch SpaceShipTwo, a pretty little craft about the size of a small private jet with a rotating body, separate from WhiteKnightTwo, the launch vehicle that looks like two big planes stuck together. I admit it’s an awesome sight. But I would hate to have to tell her the blindingly obvious: this plane will never reach space. So far the only thing Virgin Galactic has managed to launch above the stratosphere is Branson’s monstrous ego. And at what cost: the poor residents of New Mexico were persuaded to part with nearly a quarter of a billion dollars of public funds to build his self-styled “Spaceport” for Branson’s “spaceline”, which, he claimed, by 2010 would be operating more than 100 flights a year carrying tourists into ‘space’ (by which he actually means just a short, 5-minute segment of weightlessness at the top of a two-hour flight arc). Four years after this deadline, and with billions spent on development, there have been only four powered flights, no paying passengers, and four deaths. This is almost certainly going to prove itself one of the world’s great white elephant vanity projects. Instead of flights soaring to 320,000 feet, so far it has only managed 71,000 feet, and yet after this weekend’s crash people are still talking about it as if it’s some kind of bold, life-transforming achievement. 700 would-be spacemen and women have paid deposits for these $250,000 flights and earlier this year, as he has every year, Branson was blithely talking about lift-off for the commercial venture by next Spring. The head of the US transport safety agency said the investigation into Saturday’s crash might take another 12 months. 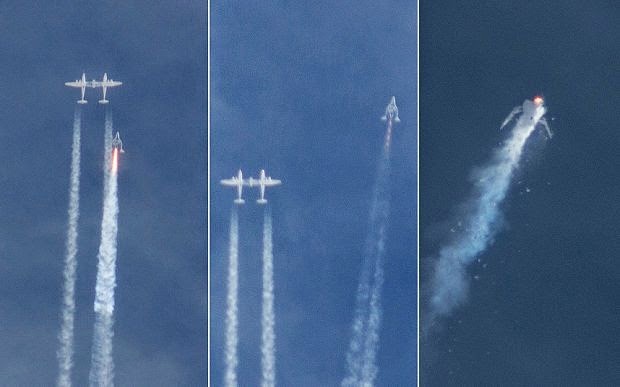 Meanwhile, as Branson mouths platitudes likes “I truly believe that humanity’s greatest achievements come out of our greatest pain”, it appears that Virgin Galactic has been accused of ignoring repeated warnings that its rocket was unsafe. According to yesterday’s Telegraph, senior aerospace engineers have voiced fears over the design and the safety protocols surrounding its testing. Also over the weekend it emerged that three senior project executives, the chief aerodynamics engineer, the VP in charge of propulsion, and the VP in charge of safety, have quit the company in recent months. It should be said that Virgin deny all this: and early reports from the investigators are suggesting a co-pilot may have pulled the wrong lever to cause the catastrophe. Nonetheless, it all sounds like a terrible, mis-guided mess, doomed to the wastepaper bin of failed Branson projects, alongside his bids to run the National Lottery and ITV. Now how Mr Branson spends his billions is none of my business, although it would be interesting to know how much of the investment in this space fiasco has been supported by tax write-offs and other public subsidies during the development, in which case it becomes taxpayers’ business too, but personally I think it’s a shame that he couldn’t do something worthwhile with the money. While Richard Branson has been trying to get his family into space, Bill Gates has given over $30billion of his fortune to global health and development. The cost of Virgin Galactic could have fed a lot of starving children. The Virgin Galactic careers section of its website proclaims: “Although our mission is bold we are humbled by the awesomeness and wonders of Space. Any egos are checked at the door. We know our success will be a function of the strength of our ingenuity and the quality of our execution. So we obsess over safety. Safety is our North Star.” Yeah, right. I thought of explaining that this plane would never reach space, let alone the moon (which is the destination that Izzy really wants to book), how the whole idea is just the fantasy of a megalomaniac. But then I thought: no, it’s actually just the dream of a child. Let’s not spoil it. For either of them. How do you solve a problem like the licence fee?